Extensions are X and Pro specific plugins available for download for all customers with a validated purchase of X or Pro. You can easily download and manage all of your Extensions directly from the WordPress admin area under X > Validation or Pro > Validation. This article covers documentation for the Email Forms extension and goes into detail on certain features where needed. After installing and activating Email Forms, you'll find it's settings under the X menu item if X is installed and activated, or the Pro menu item if Pro is installed and activated. 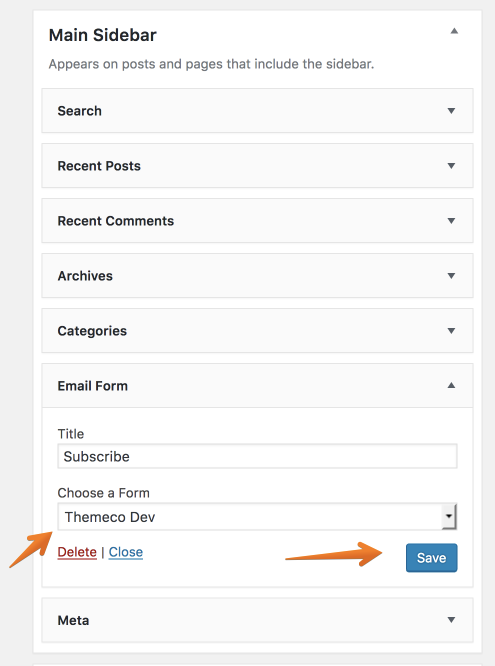 Email Forms allows you to connect your MailChimp account to your WordPress website and display email signup forms on the front-end of your website. 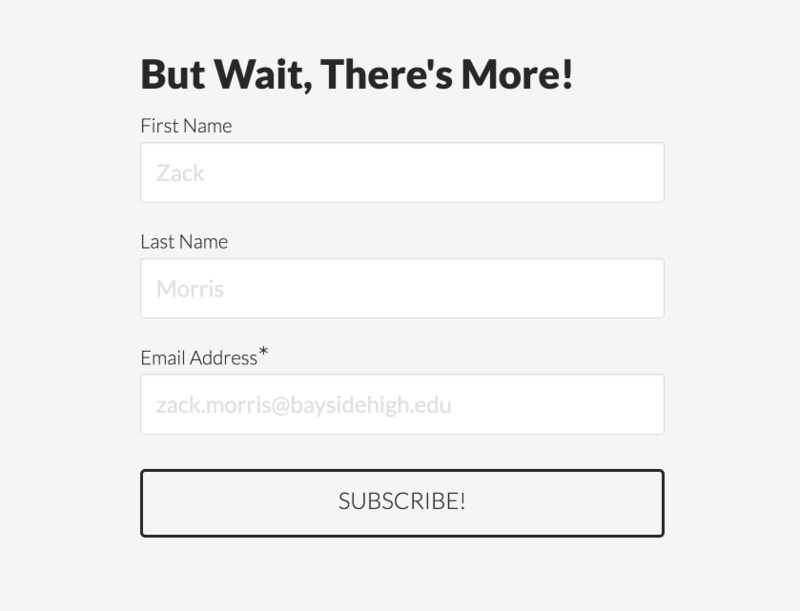 You can see some examples of Email Forms in action over on our demo site for the plugin. Email Forms - allows you to set up different email forms for your website. This allows you to select a different email list and other settings which we'll cover below. As the plugin can utilize multiple lists from one MailChimp account it's perfect for Membership type sites where you can have a general list for all subscribers and then a members only list for paid members to sign up to your newsletter from a restricted page. General settings - Configuration options for opt-ins and default forms. MailChimp - Adding your MailChimp API key to connect to your WordPress website. The first step is to setup MailChimp. For this you will need a MailChimp account, if you don't already have one you can signup here. Once you're logged into a MailChimp account you will need to handle all the usual stuff such as creating lists, importing subscribers (if you've just signed up) and setting all your details. We won't go into detail on configuring those parts as that's beyond the scope of this tutorial. However, MailChimp has some great information in their knowledge base for this such as Creating a List and Importing Subscribers along with other useful information throughout their Knowledge Base. Go ahead and paste the API key you just copied from your MailChimp account into the API key box and then click on Update. You should now see some extra settings and a success message that your website is now connected to your MailChimp account. If everything has gone correctly, you'll also be able to see the Email Lists which the plugin has pulled from your MailChimp account. 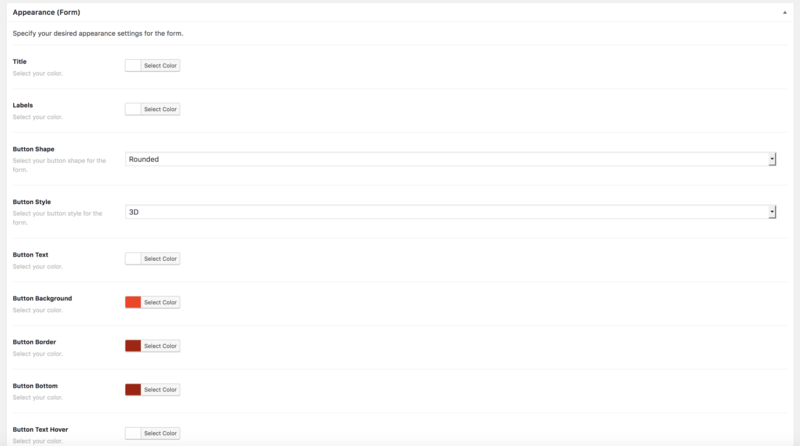 If for some reason your list isn't showing just click on Refresh and the plugin will re-populate the lists from your MailChimp account. Now you've connected your website to MailChimp navigate to the General Settings tab in the Email Forms settings. Here you can set whether to automatically opt-in newly registered users or not. This allows you to automatically add them to a list in your MailChimp account useful for if you want to use automated workflows where maybe you send anyone new to the list a welcome email after 24hours or a promotional offer. You'll also be able to select the form to be used if you don't specify a form ID when adding the email form shortcode which we cover below. For this to populate you will have already needed to create an email form within the Email Forms settings. First of all, make sure you're on the Email Forms tab and then click on Add New Form. Email List - The Email List from your MailChimp account that you want new subscribers to be added to. Confirmation Method - When a user successfully subscribes to your list either show a custom message or redirect to a page of your choice (useful if you'd like to provide a free download etc). Confirmation Message (if you select a message in the Confirmation Method option) - Enter your custom message to show once a user has successfully subscribed, plain text only. Confirmation Redirect (if you select Redirect in the Confirmation Method option) - Enter the URL of the page you'd like users to be redirected to upon successfully subscribing to your list. Name Field - Select how the name field displays on your subscription form either: None (The name field won't display), First, Last, Full (separated) or Full (Combined). Full Name Placeholder - This option will vary depending on what you selected in the previous step. For example, it may only be a first name placeholder. Enter the text (plain text) that you want to be the placeholder for the name field. Name Requirement - Select whether you want to require a user to enter their name. Email Field Placeholder - Enter the email placeholder which will display in the email field before a user starts typing. 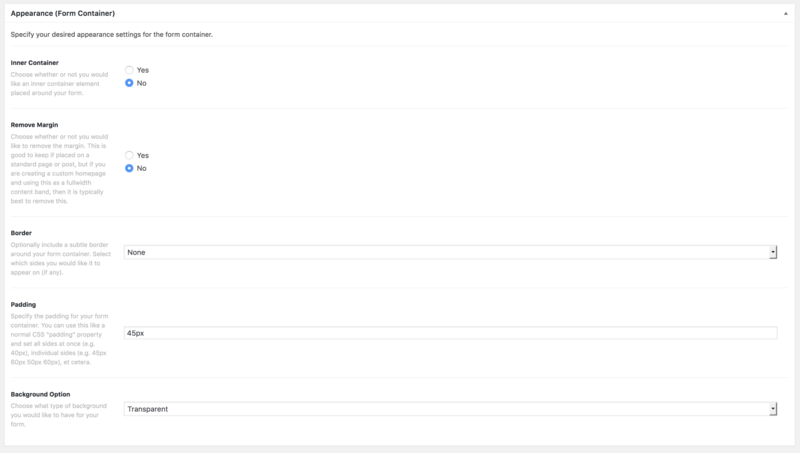 Submit Button Text - The text that displays in within the submit button. Plain text only. Show Labels - Select whether to display labels before the output of the subscription fields. If you selected to show label before the inputs in your subscription form, you'll also see options for the following. The next options all relate directly the appearance of your form. Custom Class - Allows you to specify a CSS class of your choice, which you can then use to apply custom styling to your form. Font Size - Set the font-size of all the text for your subscription form. Max Width - Allows you to specify the maximum width in pixels that your subscription form will take up. Custom Styling - Set custom styling on or off, if enabled you'll be presented with another set of options for modifying the appearance of your form. Inner Container - Yes or no, select whether you want the inner container to be placed around your form or not. Remove Margin - Select whether you want to remove the margin around the form or not. This is good to keep if placed on a standard page or post, but if you are creating a custom homepage and using this as a fullwidth content band, then it is typically best to remove this. Border - Allows you to select a subtle border to display your form. Padding - Allows you to set the padding for your form container. Requires you to enter a PX value, i.e, 45px. Not 45 for example. Background Option - This option allows you to set a background for your subscription form, useful if you'd like to create a full-width section for your subscription form and want a background behind it. You can select from either Transparent, Color, Pattern or Video. The next set of options all directly relate to the form appearance and colors. All options are self-explanatory and let you set various colors using color pickers for different aspects of the forms, such as buttons, hover colors etc. Once you're happy with your form configuration to go ahead and click on Publish. Just select your form from the drop-down and click save. Congrats! You have now successfully configured your brand new Email Form. How to create text over image with button? Mailchimp element says "No forms available"
Best way to create a contact form that sends a message and adds entry to mail chimp account? How do I connect Mailchimp to a form I created in the Footer Builder?